Free Printable Paw Patrol Matching Worksheet. Free Printable Paw Patrol Matching Worksheet activity that you can use to have your kids practice writing and have fun matching the favorite Paw Patrol characters. You can use this free printable Paw Patrol Matching Worksheet for your school, home-school, tutoring or just for fun. Your students can match the Paw Patrol characters with the correct name and then practice writing skills at the same time. 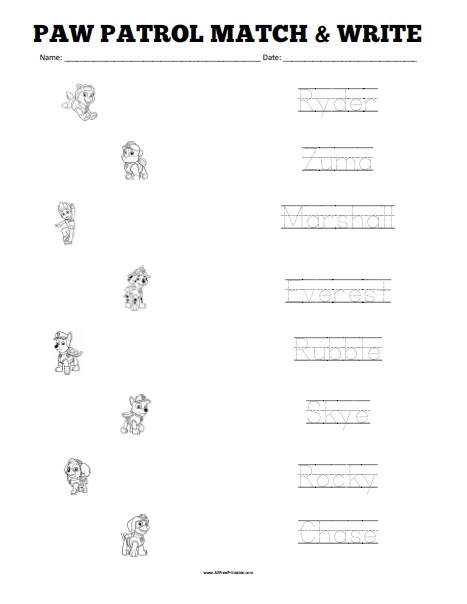 Kids can practice writing skills with 8 words like Zuma, Skye, Rubble, Ryder, Everest, Rocky, Chase and Marshall. Print this Paw Patrol Matching Worksheet free using your home or school printer and share with students. Like Ryder say No job is too big, no pup is too small! Click the link to download or print the Paw Patrol Matching Worksheet free in PDF format.